What Is the Difference Between Cockroaches & Water Bugs? Cockroaches and water bugs make satisfactory, if unusual, pets, but they are two entirely different types of insects requiring radically different husbandry protocols. Roaches and water bugs not only belong to separate evolutionary lineages, they exhibit differences in morphology, diet and habitat selection. One of the most important differences, especially as it relates to insect-keeping youngsters, is that water bugs can and will bite the hand that holds them, while cockroaches are typically not aggressive. Because water bugs and cockroaches look alike -- large, black or brown bugs with six legs and folded wings -- many people call water bugs cockroaches and vice versa. However, the two insects are not closely related. Along with termites, cockroaches form the order Blattodea, which is itself a sister taxon to the order Mantodea, which contains the praying mantises and their kin. By contrast, water bugs are members of the order Hemiptera -- a group sometimes called the "true bugs." Like other members of their respective groups, cockroaches have mouthparts designed for biting and chewing, while water bugs have sharp, beaklike mouths designed for piercing their prey’s bodies, injecting a digestive enzyme and then sucking out the liquefied tissues. Water bugs fly well, as do some but not all cockroach species. You are most likely to observe water bugs in or near water, while roaches are terrestrial organisms that live on dry ground. Whereas roaches hide under leaf litter, inside hollow logs or within the walls of human dwellings, water bugs often lurk at the bottoms of ponds, rivers and swamps, where they may hide under rocks or cling to vegetation. To survive in these greatly different habitats, each bug lineage has evolved different types of legs. The legs of water bugs are effective for water propulsion and grabbing prey, while cockroaches have cursorial legs well-suited for running. Cockroaches are some of the world’s most accomplished scavengers, and they can adapt to eating virtually any food source. Nevertheless, they primarily consume plant-based food sources -- they rarely consume dead animals. By contrast, water bugs are predaceous insects, who capture insects, fish, frogs and other small vertebrates. This has led water bugs to evolve front legs that can grasp prey, while cockroaches have evolved an incredible suite of sensory organs, which help them locate hidden foods. The best maintenance protocols vary from one species to the next, but most cockroaches thrive in clean, dry, well-ventilated plastic containers furnished with plenty of hiding spaces. Mist one-third of the cage with water every few days, and feed them a mix of grains for calories and vegetables for water and vitamins. 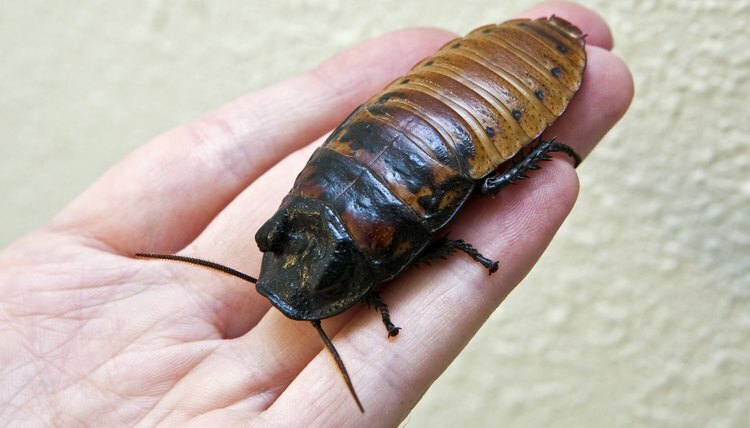 If you wish to keep cockroaches for pets, purchase non-indigenous species that do not fly, which will help prevent them from escaping and establishing themselves in your home. To maintain water bugs, provide them a 10-gallon aquarium with several rocks or branches on the bottom. Add about 7 gallons of dechlorinated water to the tank and cover it with a tight-fitting lid. Water bugs do not require a filter, but you should conduct a 50 percent water change weekly. Feed your water bug small minnows or insects weekly. Do not handle the bug, as it may deliver a very painful bite; instead, scoop it into a plastic cup when it is necessary to move it. Wilderness and Environmental Medicine: Bites Caused by Giant Water Bugs Belonging to Belostomatidae Family (Hemiptera, Heteroptera) in Humans: A Report of Seven Cases.